Waiting on Wednesday is a weekly meme hosted by Jill at Breaking the Spine, that spotlights upcoming releases we can't wait to read. My pick is Into the Still Blue by Veronica Rossi! The earth-shattering conclusion to Veronica Rossi's "masterpiece" Under the Never Sky trilogy and sequel to the New York Times bestselling Through the Ever Night (Examiner.com). Their love and their leadership have been tested. Now it's time for Perry and Aria to unite the Dwellers and the Outsiders in one last desperate attempt to bring balance to their world. The race to the Still Blue has reached a stalemate. Aria and Perry are determined to find this last safe-haven from the Aether storms before Sable and Hess do-and they are just as determined to stay together. Meanwhile, time is running out to rescue Cinder, who was abducted by Hess and Sable for his unique abilities. And when Roar returns to camp, he is so furious with Perry that he won't even look at him, and Perry begins to feel like they have already lost. Out of options, Perry and Aria assemble a team to mount an impossible rescue mission-because Cinder isn't just the key to unlocking the Still Blue and their only hope for survival, he's also their friend. And in a dying world, the bonds between people are what matter most. In this final book in her stunning Under the Never Sky trilogy, Veronica Rossi raises the stakes to their absolute limit and brings her epic love story to an unforgettable close. I'm ridiculously excited about this book. Veronica Rossi is one of my favorite dystopian authors ever. It seems like she gets better and better with each book. 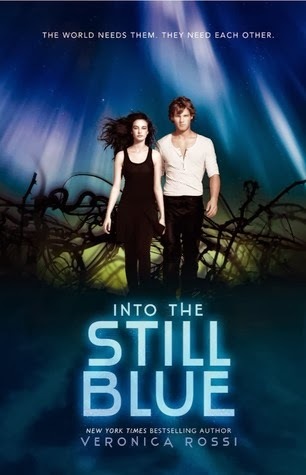 I can't wait to find out what happens to all my favorite characters - especially Roar <3 - in Into the Still Blue! The release date is January 28, 2014. What book are you waiting on this Wednesday? Awesome pick. I need to read this book soon. I know it's on Edelweiss.